This morning I had 13 miles on the plan to run. After the excitement of running long distances in new locations over the last few weeks, the thought of doing a half marathon from my door on the overly familiar streets of Cheltenham really wasn’t stoking the fires of motivation. After all the miles I’ve put my legs through recently and running a new parkrun PB yesterday everything ached; I’d already turned down the offer of running with company because I knew I didn’t have their pace in me and I really wasn’t in a chatty mode. 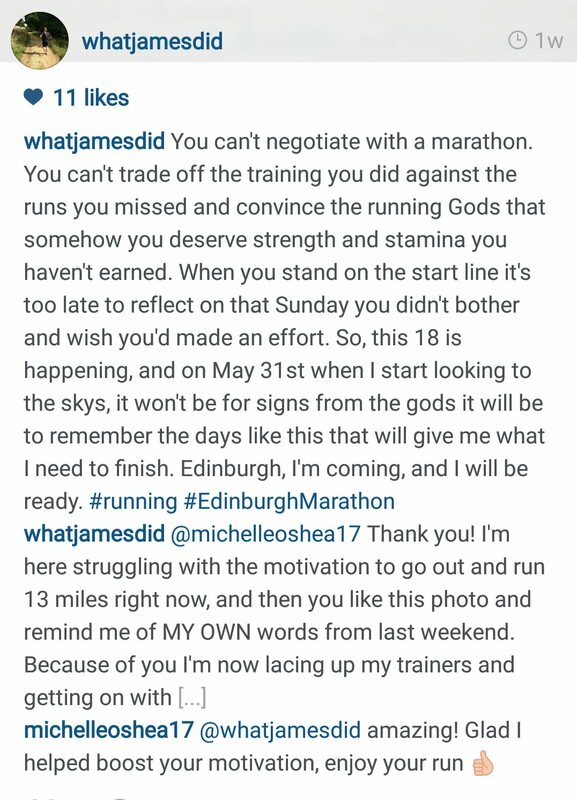 In fact I was sat on the end of my bed in all my kit making excuses and justifying why skipping a shorter run wasn’t the end of my marathon training. So it was that I found the motivation to get out the door and go running. Once I was out there I was faced with the age old problem of where to go…I’ve covered every inch of this town ten times over, I’m sure of it! Everything hurt as I started, and I kind of liked the pain; it was almost a badge of honour for the effort I’ve been putting in recently. 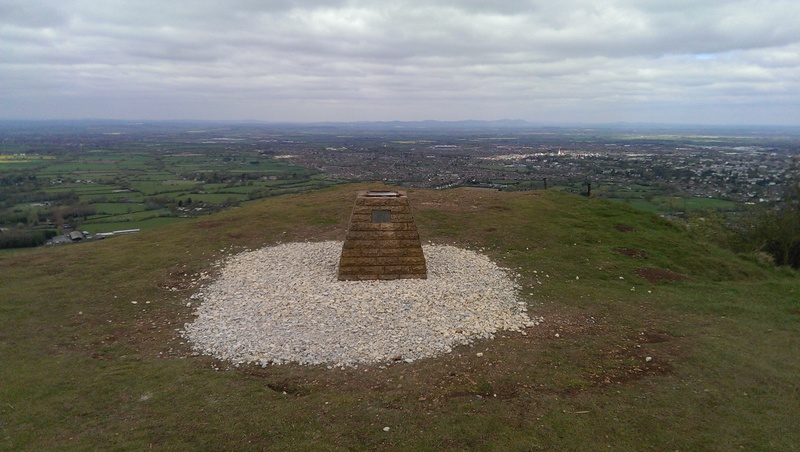 Reveling in the discomfort I decided to seek it further so I set my sights on the top of Leckhampton Hill, and by top I mean 5 miles from home over the back of the hill at the Air Balloon pub, all by road. I didn’t stop for a drink, instead I turned and headed back down before diverting out on to the hill for some trails action and home down the hill the fun way. It was a great run for so many reasons, even if the pace and fluidity weren’t among them! So I went running, as I have tended to do recently I listened to a podcast while I did. I’ve been listening to Scroobius Pip’s Distraction Pieces podcast on my long runs, he has a series of fascinating interviews with some incredibly interesting people, all lasting 60-90 minutes. Today I started by listening to his interview with Eddy Temple Morris, not someone I knew much about. Let me just put your minds at rest and assure you this isn’t a cry for help and I have no plans to add to those statistics, but I can relate to all the reasons why that figure is so high. There’s another post in this and I hope you’ll forgive me, dear reader, for digressing from the running chat sometime and sharing my thoughts, but the important point about today is the podcast talked about a charity, C.A.L.M. C.A.L.M. (or the Campaign Against Living Miserably) is a small charity with the big job of changing the pattern of young male suicide. I’ve been aware of this organisation for a while but hearing it discussed today confirmed my suspicions that I should be helping. So, I will be looking over the next few days at how I can best be of assistance, which I’m guessing will primarily be through fundraising and promotion, and talking honestly about what it is like to be a man who sometimes has dark thoughts. I hope you will all support me and this amazing charity…watch this space for how you can, and in the meantime watch the quick video below to see why. Thanks. This entry was posted in CALM, Life, Running, Running, Training and tagged C.A.L.M., Charity, Eddy Temple Morris, fundraising, podcast, running, Scroobius Pip, suicide. Bookmark the permalink.